Atrix Motorola, Gadgets 'James Bond' Equipped Fingerprint ~ " World Information "
Jakarta - Amazed by James Bond character with all the sophistication gadgetnya? Look at Motorola Atrix, one of its features could be making you fantasize about a 007 such intelligence. Motorola Atrix claimed as the world's first smartphone equipped with fingerprint recognition technology or fingerprint recognition. Its function, to ensure that only the owners of smartphones that can use it. Reported by the Daily Mail and quoted on Thursday (05/05/2011), each will use it, users must Atrix 'sweep' (swipe) their finger on the phone screen, and the phone will identify the owner of the original. Every touch of the user on the buttons on the phone will be recognized by this fingerprint security system and approve any operations conducted. Sophisticated is not it? 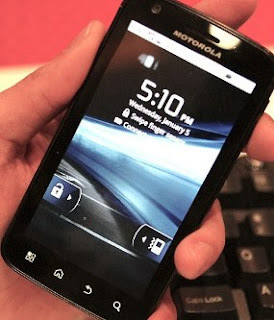 Atrix promoted Motorola as the world's powerful smartphones that can be connected to various devices. Smartphones that were introduced this past January using the Android operating system Froyo. In addition has provided the ability to 4G, are also embedded in the body Atrix dual-core processor Nvidia Tegra 2, 1GB of RAM. Mobility Motorola CEO Sanjay Jha, introduce Atrix as the best phones released by Motorola is currently 4 inch screen with 960x540 pixel resolution. But he has not called its retail price.